In Europe, the combination of low winter heating demand, high refinery runs, and increased imports have kept distillate fuel oil inventories in the Amsterdam, Rotterdam, and Antwerp (ARA) area far above normal. Higher inventories have lowered distillate futures prices in the ARA area to a point where inventories are being held in floating storage and imported cargos are being diverted to longer voyages. Europe is a net importer of distillate fuel oil, which is used both as a heating fuel and as a transportation fuel. In addition to Russia and the United States, Europe imports distillate from the Middle East and India. Ships departing from those locations have two options to get to the ARA area, a key port and transit hub for petroleum and refined products. The shorter route, which can take 15 to 20 days, travels through the Red Sea, the Suez Canal, and the Strait of Gibraltar. The longer route, which can take 30 to 40 days, involves going around Africa's southernmost point, the Cape of Agulhas. The longer voyage allows more time to find a buyer, or onshore storage space, and also provides a return from the higher priced, later delivery date. Trade press reports indicate that several cargoes from the Middle East and India are opting for the longer voyage. A lack of storage space and a large contango have pushed distillate supplies into floating storage and have encouraged import cargoes to take the longer shipping routes. Contango is a situation in the futures market where prices for delivery dates further in the future are higher than those for more proximate delivery. When contango in the futures contracts become sufficiently large, market participants can lock in a profit by purchasing distillate supplies on the spot market, chartering a vessel, and selling a longer-dated futures contract. Futures prices for gasoil (distillate) on the Intercontinental Exchange (ICE) gasoil futures market are currently in a wide contango: the difference in contract prices one year out from the prompt contract (the most proximate future month) and the prompt contract, known as the 13th-to-1st month futures spread, was $8.90 per barrel contango in January. As a result, trade press reports that several vessels in European waters, such as off the coast of Gibraltar in southern Spain and outside of the ARA ports, have been booked specifically for distillate floating storage. Distillate inventories in the ARA area have exceeded the previous five-year average since the middle of 2014. Distillate inventories were pushed higher when low water levels on the Rhine River disrupted barge shipments in late 2015. 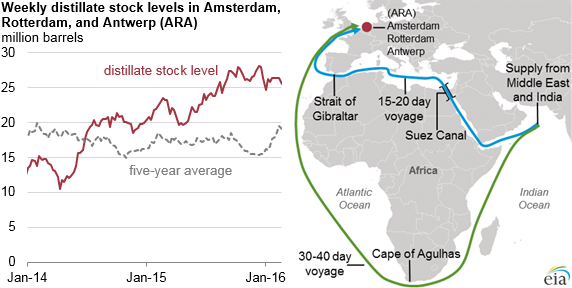 Rhine River water levels have risen in recent months, allowing normal barge traffic to resume, but reduced distillate heating oil demand because of the mild winter kept ARA distillate inventory at elevated levels. As demand for gasoline in the United States and in West Africa increased last summer and fall, higher gasoline crack spreads led to increased European refinery runs. The increased refinery runs produced distillate along with the more profitable gasoline. These factors—reduced heating demand, increased European refining runs, and increased imports—have pushed independently held distillate inventory levels in the ARA area to more than 26 million barrels in recent months, more than 7 million barrels higher than the five-year average. More information about the physical and financial implications of high distillate inventories in Europe is available in This Week in Petroleum.